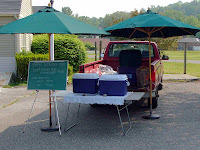 Last Saturday, May 26, Phil started to attend the weekly Farmer's Market in Kent, selling mostly ground beef. The Market is held on the Kent Green every Saturday from 9-12 through the season which ends in late October. The vendors include 3 vegetable growers, a cheese maker, a baker, homemade soup, and a table selling homemade dog treats.